The cabin is nestled among huge hardwood trees with a beautiful backdrop of the lake. A perfect get away for nearly any season the cabin offers something for everyone. During the warmer seasons, you can enjoy the hammock swaying in the breeze or you can put your feet up and relax on one of our three decks overlooking Norris Lake. If it’s a chilly evening you can build a bonfire in our outdoor fire pit or cozy up inside to a fire around the beautiful stone fireplace. During the days, your activity choices are nearly limitless. Spend the day playing on the lake, dining at one of the close by marinas for lunch, taking a nap, reading a book, or playing games. There are plenty of places nearby to enjoy hiking, biking, or rafting. With Knoxville just a short 45-minute drive away you can go shopping or find great restaurants for dinner. The cabins interior is comfortable and cozy, with a family room that provides plenty of seating and beautiful vaulted cedar ceilings. When you enter the cabin you’ll immediately enjoy the open airy feeling and notice all the natural light. The home features two bathrooms and two bedrooms with king size beds, (one up and one down) along with three twin beds located in the loft. The kitchen is fully equipped with everything you need to make cooking simple, and the lower level features a washer and dryer for your convenience. The large screened in front porch makes for a great place to enjoy your morning coffee overlooking the lake and the open-air side porch is great for grilling out and enjoying your dinner. Owners recently added internet for their guests also. The trees are tremendous and keep things fairly cool in the summer with all their shade. Comparatively speaking we have a gradual slope to the lake that reaches our large private dock. We also have two wave-runner platforms available for your use. Our property has nearly 400 feet of lake frontage with a nice curve that ads to the surrounding water view. Norris Lake has 800 miles of shore line that wind through the foothills of Tennessee. Much of the land is protected which helps keep the forestry and wildlife safe and in abundance. The lake is very deep and unbelievably clear. Enjoy our cabin for a fun family vacation, a fishing week with the boys, or a relaxing weekend away with the girls. We are the Jackson/Saldana family and avid lake goers. We spent our childhoods camping, boating, and enjoying the water anyway we could. We have traveled around enjoying time on many lakes in Tennessee, Kentucky, Ohio, and Virginia and finally decided to put our roots down here at Norris Lake. We now have children of our own and wanted a place to come together and revel in the joys of family time and fellowship. We welcome you to our home and hope you enjoy it as much as we do. Had a wonderful time with family. Beautiful spot on the lake. Wonderful get-away-from-it-all. Incoming bad weather came the day we were to leave, and owners graciously granted us to stay another day. The ladder going up to the loft beds was challenging for grandma, and the 3 and 7 yo were obsessed with wanting to climb it, but we managed. We had to buy bedding, bring towels, and paper products and take our garbage to the dump, but the extra efforts were well worth it! Our group consisted of two couples with three teen boys ... This was the perfect place for us! The cabin itself was very quaint, clean, and had everything we needed for our stay. The inside was cozy and nicely appointed. We made much use of the outdoor living area, and the screened-in porch was fabulous! The on-site dock made our boating and other lake activities so easy. We were able to enjoy so much more of the lake since we didn't have to take the boat off water in the evenings, or transport ourselves from the marina. We will definitely keep this on our list for future lake excursions. A perfect home away from home -- and reasonably priced!! Note that the driveway from the road to the cabin is very steep and requires a four-wheel drive no matter what the weather. If you have to park at the road and carry supplies down to the cabin it is a bit of an arduous haul. We had four wheel drive so it was not an issue for us. Thank you so much Lynn and Stephanie for a wonderful Labor Day weekend!! We left water logged, sun burnt, and so so happy ... with plans to return soon! This cabin was wonderful. Enjoyed sitting on the screened porch and looking out over the lake every morning/evening. We used the outside grill for most meals but the kitchen is well equipped. Gentle slope to the private dock...only a few sets of steep steps near the dock area...this is rare to find so it was nice for us in our 50's! Only downside was no cell service or cable but that can't be helped in this area. It was kind of nice to be uplugged for awhile and catch up on reading or just stare at the lake. 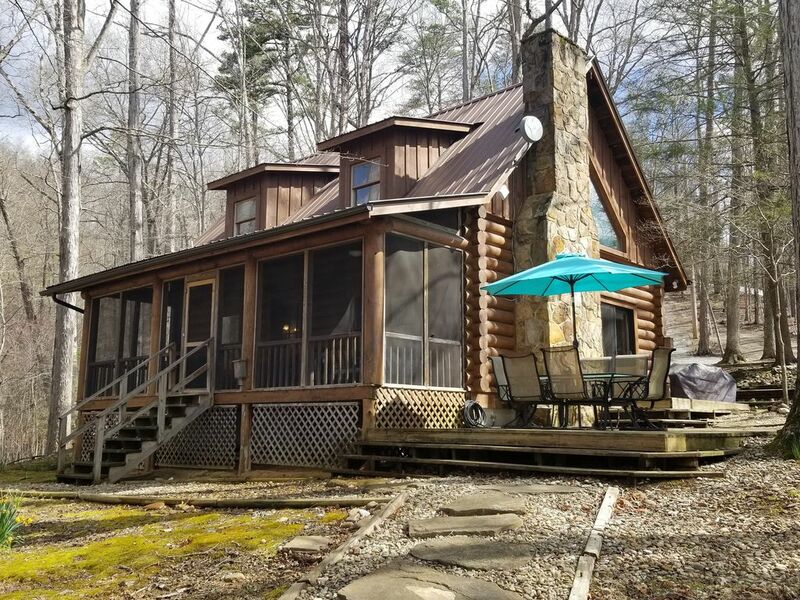 I would highly recommend this cabin for a family or a couple that want to get away from it all. Great location. Worked out great for us. Cozy and quaint. Owners were super easy to work with. We needed a place last minute as our original booking sold. Glad we found this home. We would rent again in a heartbeat. Close to our favorite marinas and off the main lake and open channels. Enjoyed having the jet ski pads for our skis.